The Congressional Leadership Fund (CLF) released a new ad on Thursday hitting House Minority Leader Nancy Pelosi (D., Calif.) for what it describes as her negative attitude toward the growing economy, bonuses to millions of Americans, and lower unemployment. 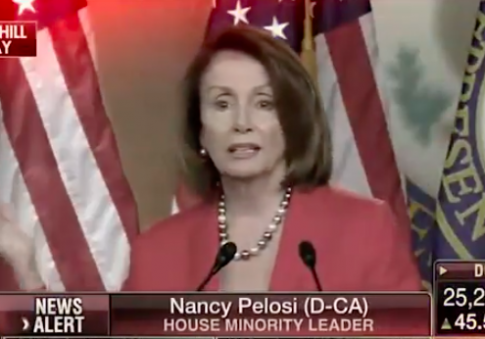 The ad, titled "Negative Nancy," cites Pelosi's frequent complaints about the economy and about news benefiting the middle-class. The ad shows clips of Pelosi throughout the past year where she called bonuses for millions of Americans "crumbs" and said tax cuts were the equivalent of "armageddon." "Hip hip hurray, unemployment is down," Pelosi said sarcastically. "Nancy Pelosi is the most toxic, unpopular, and polarizing politician in the country. I am beyond thankful that she continues to lead the Democratic Party and I hope that she never, ever retires," said Corry Bliss, Executive Director of CFL, a political action committee supporting Republicans in the House of Representatives.